Today I found out why our galaxy is called the Milky Way and what it’s called in other languages. No one knows exactly who came up with the name, but it isn’t difficult to see how the name came about. 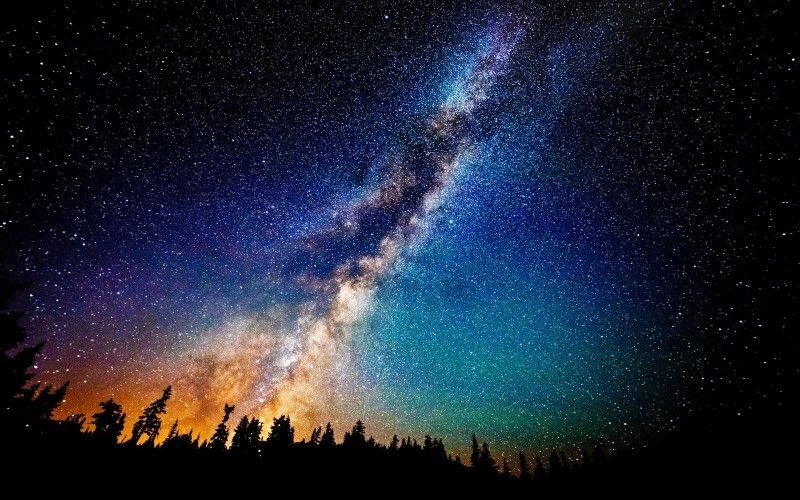 From Earth, at least if you’re well outside the boundaries of city lights, our galaxy looks something like a band of milky light over a black background, as we are viewing it on it’s side and the billions of distant stars in our galaxy create a nice visible band of light. As for why the ancient Greeks called it the “milky circle,” the myth goes that Zeus brought Heracles to Hera to suckle when she was sleeping. Hera was in conflict with the little infant, as you would be if your husband brought home a half-mortal child that wasn’t yours. As baby Heracles was having his meal, Hera woke up suddenly and pushed him away, resulting in a few drops of spilt milk. The drops created the galaxy that is now known as the Milky Way. Various other languages have translations of “Milky Way” as the name of the galaxy, such as the German “Milchstrasse” and the Norwegian “Melkeveien.” There are, however, many other mythological origin stories that explain the various alternate names of the Milky Way in other languages. Armenia has a different idea about the Milky Way. There, it’s called hard goghi chanaparh, or “Straw Thief’s Way.” The story goes that the god Vahagn stole cartloads of straw Barsham, the Assyrian King, and took it to Armenia during a particularly cold winter. To get there, he fled across the Heavens and dropped some straw on the way, making the Milky Way. Likewise, the Milky Way is called various forms of “straw way” in several other languages across Central Asia and Africa. It’s Ça Taxina Taça in Chechen, or “the route of scattered straw;” traditionally “kumova slama” or “Godfather’s Straw” in Croatian, though Milky Way is also used now in Croatia; and samanyolu or “road of straw” in Turkish. It’s likely that Arabs heard the story in Armenia first and spread the name to various other lands. In many northern countries, the Milky Way is called the “Winter Way,” such as the Icelandic “vetrarbrautin,” the alternative Norwegian “vinterbrauta,” and the Swedish “vintergatan.” The reason for this is thought to be because, in the Northern Hemisphere, the Milky Way is more visible during the winter. In much of East Asia, the galaxy is referred to as the “Silver River.” A Chinese legend says that once upon a time, there was a beautiful young maiden named the Goddess Weaver, the daughter of the Celestial Queen Mother. One day, a Buffalo Boy was tending his herd when he spied the Goddess Weaver bathing in a nearby lake. The two instantly fell in love, and were soon married and produced two children. But the Celestial Queen Mother grew jealous of their love and stole the Goddess Weaver away. When the Buffalo Boy pursued them, the Queen took out a pin and drew a silver river between them so that they would be separated forever. That silver river was the Milky Way. In Japan and Korea “silver river” means galaxies in general, not just the Milky Way. Credit & Copyright: Juan Carlos Casado (TWAN)Explanation: Have you ever seen the band of our Milky Way Galaxy? Chances are you have never seen it like this — nor could you. In a clear sky from a dark location at the right time, a faint band of light is visible across the sky. This band is the disk of our spiral galaxy. Since we are inside this disk, the band appears to encircle the Earth. The above spectacular picture of the Milky Way arch, however, goes where the unaided eye cannot. The image is actually a deep digital fusion of nine photos that create a panorama fully 360 across. Taken recently in Teide National Park inTenerife, Canary Islands, Spain, the image includes the Teide volcano, visible near the image center, behind a volcanic landscape that includes many large rocks. Far behind these Earthly structures are many sky wonders that are visible to the unaided eye, such as the band of the Milky Way, the bright waxing Moon inside the arch, and the Pleiades open star cluster (can you find it?). The deep exposure also brings out many sky wonders normally beyond human perception, many of which are labelled on the annotated image version, including Barnard’s Loop, visible above as the half red ring below the Milky Way band. A popular festival in Japan is Tanabata, a star festival. The festival has its origins in the “Silver River” myth. On the seventh day of the seventh month each year, the Goddess Weaver and the Buffalo Boy are allowed to meet for just one day. The people celebrate with a day off work or school, and they write wishes on pieces of paper which are then hung from trees. In some cities, people light lanterns to float in nearby rivers. It’s likely that the celebration got its start in China some 2000 years ago before it migrated to Japan, where it really kicked off. The Milky Way is thought to contain over 100 billion stars, and could contain up to 400 billion. It’s about 100,000 light years across. Along with orbiting around the Sun at 66,600 mph, the Earth is also rotating at its axis at about 1,070 miles per hour. So you are simultaneously hurtling around the sun at 66,600 mph while sitting on a rock that is spinning at 1,070 mph. On top of that, our whole solar system is rocketing through space around the center of the Milky Way at around 559,234 mph. On top of that, our galaxy is hurtling through space at around 671,080 mph, with respect to our local group of galaxies. On top of that, for all we know, our entire Universe is hurtling through some unknown medium at some other ridiculous speed. The most common star in our galaxy is the red dwarf, which is about 1/10 the mass of the sun. Around half the stars are older than the sun, which needs some 4.5 billion candles on its next birthday cake.